ZebraCoupons is now live! 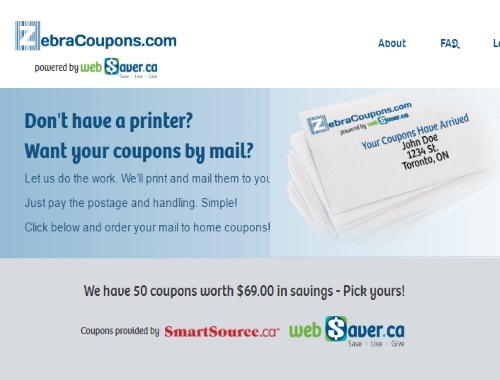 We gave you all a sneak peek yesterday of this new coupon website from Websaver! Now you can be one of the first to request a coupon envelope and get it without paying the shipping charge! We have blogger exclusive promo codes to share with you! The promo codes are for new members to use to get their first order "Free". Normally there is a fee for shipping and handling on ZebraCoupons and with our promo code you won't have to pay that. If you are interested in receiving a promo code from us, please like our Facebook Page if you haven't yet and write a comment on our post about ZebraCoupons and I will get one to you. While supplies last, I only have a limited number available, so be quick! $1.00 Off Maxwell House Keurig® * compatible pods, any size or variety. Your coupons will be printed and mailed to you within the next 1-2 business days and sent via Canada Post. Please note you will have to make a new account with ZebraCoupons, you will be asked your information at the checkout stage. Click here to request your coupons.